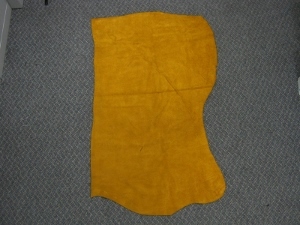 The cow split leather is sold by the square foot. The hides range from 4 to 12 square foot and are marked with the size. Shapes and sizes will vary. The hide pictured above is 7.5 sq. ft., measuring 112.5 cm long by 55 cm wide across the middle. It weighed 0.72 kg.